London-born Benjamin Benjamin (no, the typewriter keys didn't stick; his name is double Benjamin) is the General Plant Manager of I.Miller And Sons Co., in their sprawling big manufacturing plant on Twenty-Third Street in Long Island City, New York. He is also one of the most interesting of the many interesting people in the General Shoe family (1). 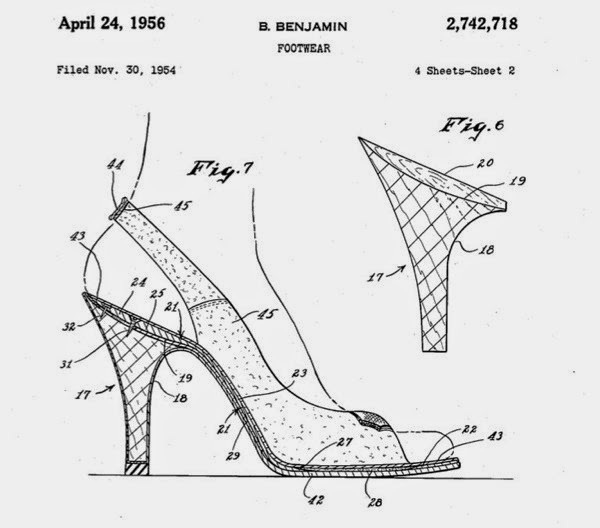 He joined on May 19, 1952 … directing the making of women's shoes that have won a solid reputation all over the world. My heritage. 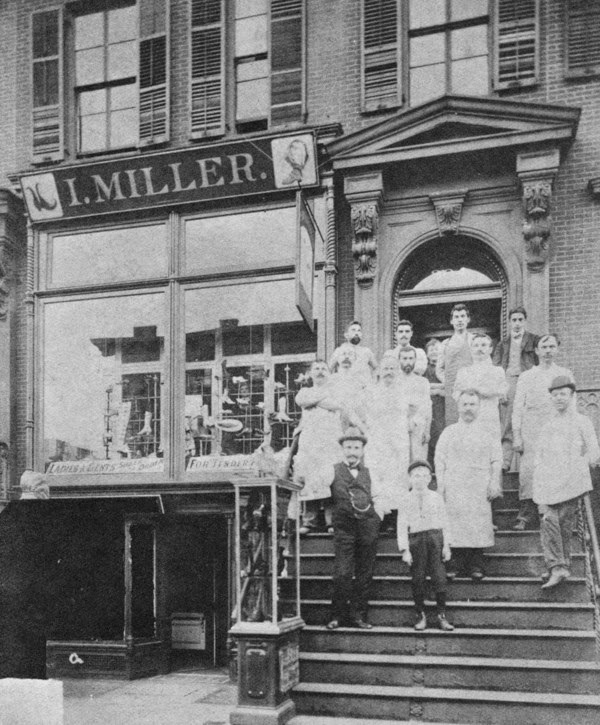 Mr. Israel Miler and shoemakers on 23rd street. The little boy is my uncle George. 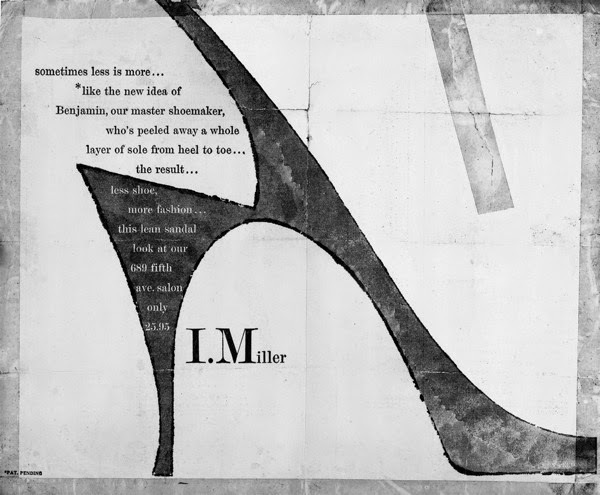 A larger (I.Miller) factory was opened in Brooklyn and then in 1924 they opened a factory at 43th street and 23rd street in Long Island City … and they made somewhere around 2,500 and 3,000 pairs of expensive shoes a day... He (André Perugia) used to come over here and advise the organization and do a collection in the Miller factory. The Long Island City factory was eight floors in a square block, all in red brick. Now that I'd seen the general structure I wanted to see how the product was made. Right from that first day, it was the complications of the business that fascinated me. The article also reports that Walter Zellweger, head of Patterns Dept, was leaving the company; Zelweger, along with Ruby Rosen and Robert Caltabiano were "the triumvirate that ran the plant with probably as many as 600-700 workers" (Jerry Miller). 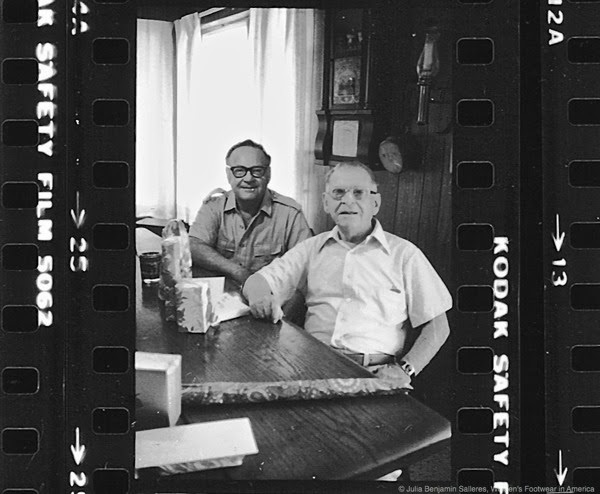 Caltabiano retained the place as factory superintendent and Mr. Miller was going to be assisted by Merwin Zuckerman. 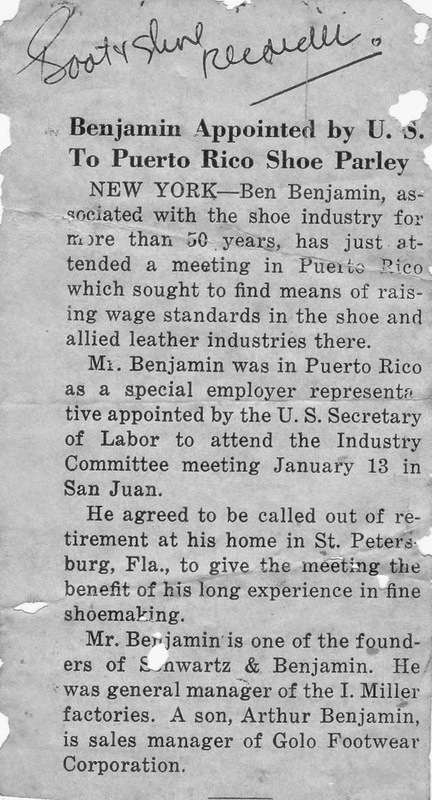 At this writing (circa 1955), Ben is just getting back from a Spring-long trip to Europe, visiting all plants licensed to make I.Miller shoes, helping them with their quality and also packing his head full of knowledge about European styles as he finds them in Italy, France, Germany, Switzerland and England. It was home-coming, too, as he went back to the scenes of his early childhood in London, and renewing friendships he has kept ever since coming to America in January 1913. 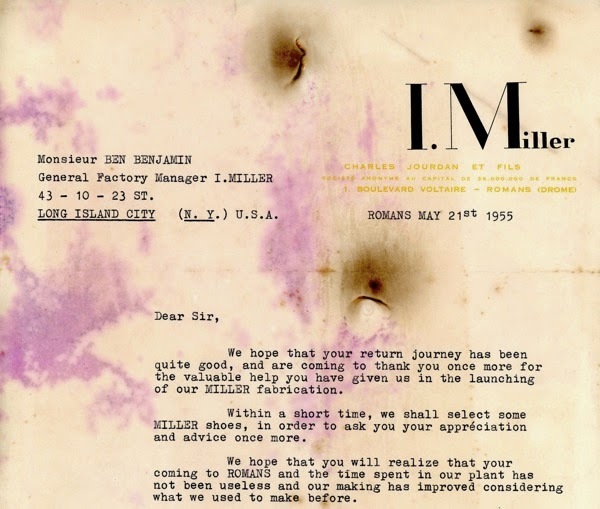 …the Millers were very innovative and made shoes all over the world. they had licensed their line in France with Jourdan, and in Switzerland with Willy Löw. They made shoes in England, Australia, and in New Zealand under their name. Before World War II, they sold the shoes and shipped them and later were made under franchise. I now they were very famous for their reptile shoes, their fashion and quality. In the design and production of feminine shoes and style, for example the sling pump type, one feature which detracts from the appearance thereof is the fact that the insole lies on top of the heel in a separate layer. It is accordingly a principal object of the present invention to provide a shoe in which there is no apparent inner sole above the heel seat and wherein the heel seat part of the inner sole has been merged or blended into the heel. 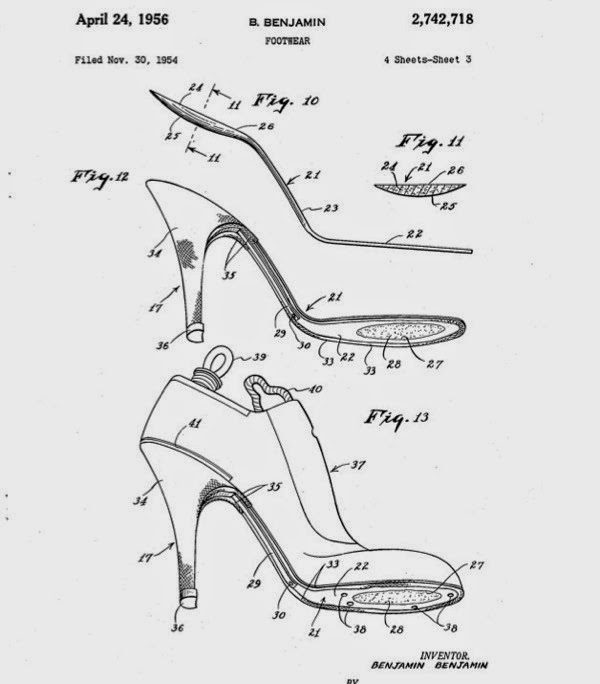 Another object of the present invention resides in the provision of a shoe in which the heel appears as a virtual extension of the shank portion of the shoe. A still further object of the present invention is the production of a shoe having a new appearance with the thin pencil line of the heel top unmarred by any layer above it. Ben Benjamin is a kindly, conscientious and pleasant-voiced man who, like his British-born wife, rose, still has a Londonese accent in spite of his 42 years in and around New York City. He is the father of Arthur L. Benjamin and of Dorothy Benjamin, both of whom live in Garden City, on Long Island. Arthur himself is stylist and promotion manager for Golo Footwear. 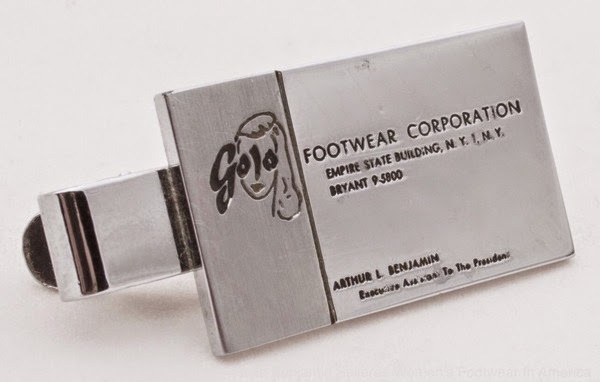 (1) | GENEral Shoe COmpany was the original name of GENESCO.